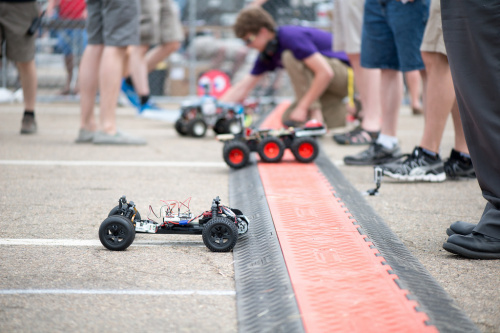 The SparkFun Autonomous Vehicle Competition (or AVC) is nearly upon us! It takes place June 20th, 2015 at the new SparkFun headquarters. This is a great event that invites people from all over the world to take place in a day of geeky revelry unseen since...well...the last AVC. This year we're going to have tons going on -- vendors, electronics activities, delicious food/treats -- and of course, robotics! Today, we wanted to remind you that if you want to compete this year, either in the ground competition or the new combat bots competition (or both! ), registration is closing SOON -- specifically on May 29th. So register now before it's too late! If you're thinking of doing the combat bot portion, you can also register day-of the event (and pay an extra $5 charge). If you're not into competing, we want you to come watch - so make sure to buy your tickets here. Hope to see you there! No wonder there is no redbots available for purchase, you maniacs keep destroying them!